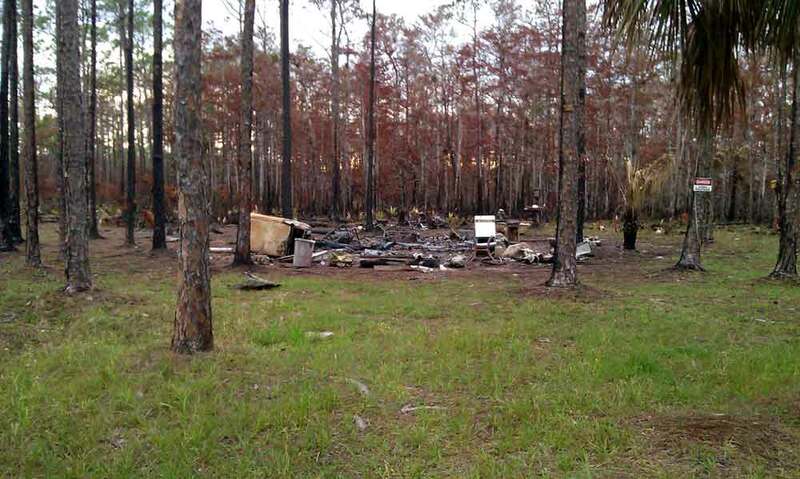 The recent Jarhead fire within the Big Cypress National Preserve boundaries, brings up the subject of how to build new or rebuild replacement buildings on exempt private property within the boundaries of the Big Cypress National Preserve. During the Jarhead fire at three locations, private properties were lost to the fire. As a exempt improved property owner myself, I have lost a building to Hurricane Wilma and I feel for the owner's loss. I have replaced the building I lost and have experienced the frustration the owners are facing in permitting and building the replacement buildings. Take heart! It can be done and it is not the impossible task you might think it is based on comments that are stated by the National Park Service regarding "meet all state and county ordinances". To build in the Collier County portion of the Big Cypress National Preserve boundaries requires dealing with two and possibly a third agency. The first agency and the starting point in building or rebuilding is the Collier County Environmental Services department. The owner will need to get a "Special Treatment" environmental permit from them. The second agency is the Collier County Building department. After the owner gets the environmental permit, they will deal with the building department. The third agency comes into play, if building a bathroom or have any plumbing in the plans. The owner would then have to deal with the Collier County Health department to get a septic system permit. That's it! The hard part is paying for all of it. I know, Someone is going to say, "I forgot the National Park Service" (NPS). I don't mention them because the owner does not have to deal with them. They are a Federal agency and deal with federal issues. Building on the private property is a state and county issue, not a federal issue. The NPS will get their comments in thought. During the environmental permit process, the NPS will be given an opportunity to comment on the proposed site plan. 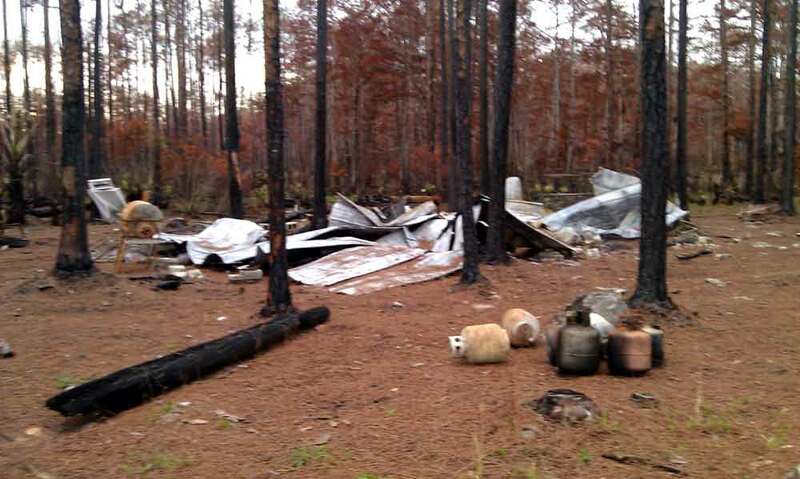 They will do that directly with the Collier County Environmental Services department. Other than making those environmental comments, the NPS has no legitimate legal involvement in building or rebuilding on private land. Do keep in mind, the Founding Law for the Big Cypress National Preserve states that what is done on the private land can not have any environmental effect on NPS land. The good news with this department, is they are very cooperative to deal with. The Big Cypress National Preserve boundary has a Collier County zoning overlay of ACSC-ST, (area of special environmental concern), as such you have to obtain a "Special Treatment" permit. Collier County zoning overlay of ACSC-ST allows building on 10% of the property size and 5% of that can be impervious. This is much bigger than most existing improved property buildings in the back country. (Expect the NPS to comment if you go much bigger than what you currently have). The paper work required can be a do it yourself deal (DIY) and the permit fee is $400. Doing this step will show the NPS you are rebuilding and then the rest of the permitting/building can take more time to do (possibly years). You can build in phases, just show it that way on the site plan. Ok! it seems like a lot to do, with lots of details and I certainly did not cover them all. Just take each step a little at a time to get it done. I don't recommend trying to rebuild with out doing the permits. The NPS will turn you in to Collier County. Then it gets really expensive to save what you have built.